The Winter Haven area received an average of 5.73 inches of gross rainfall during the month of June based on data from 7 sources. Factoring a loss of 5.61 inches due to evapotranspiration, the net rainfall totaled 0.12 inches—essentially no significant gain or loss of water. This has decreased the year-to-date rainfall deficit to -3.22 inches; up from -3.34 inches [Figure 1]. Comparing gross rainfall with long-term data, June 2018 precipitation fell below the 1st quantile of 6.04 inches—well below the historic average of 7.99 inches. Rainfall this June still fell within one standard deviation (2.82 inches) of the historic mean, however [Figure 2]. Overall, we received below average rainfall and broke even during the Florida “rainy” season. 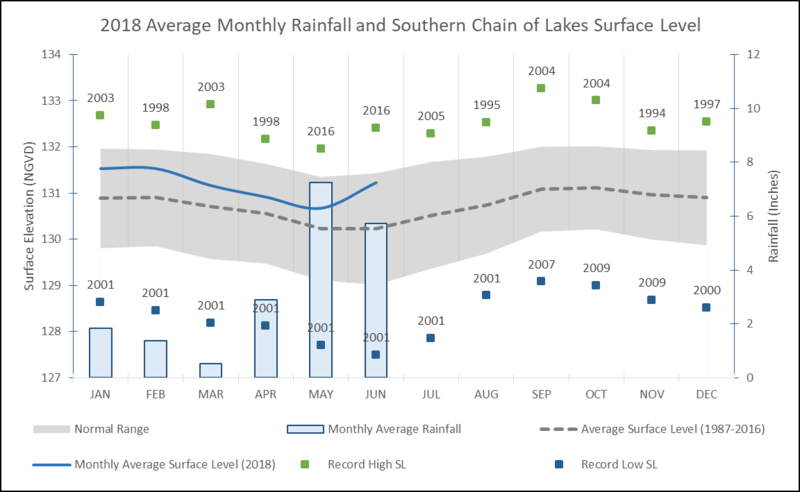 June of 2018 saw a sizable increase in lake stage for the Southern Chain of Lakes. Surface level rose 0.55 feet from 130.67 in May to 131.22 feet in June [Figure 3]. 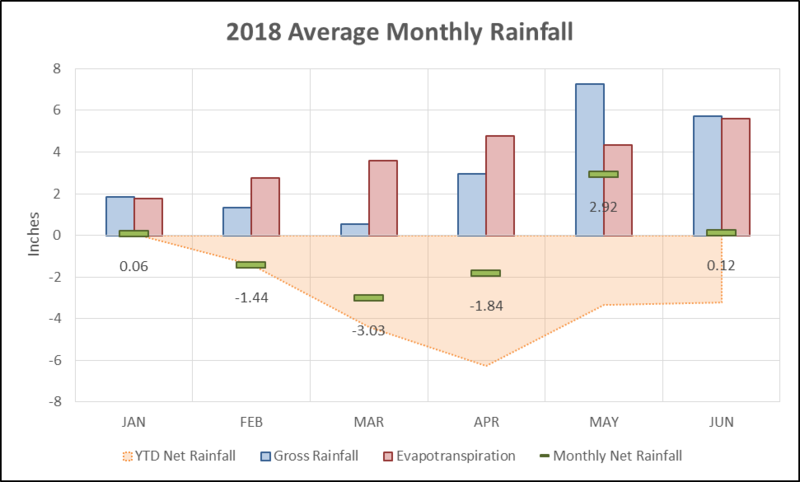 Despite the below average rainfall in June, this increase was most likely due to the water table equalizing after above average precipitation in May. 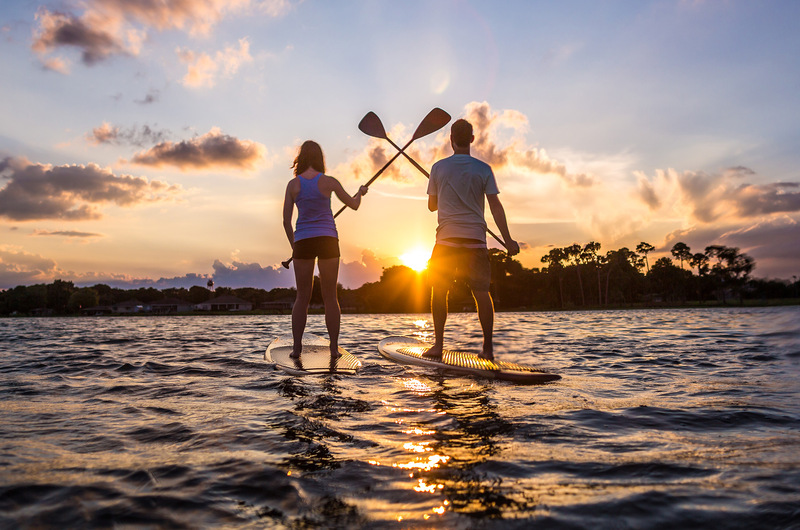 We would expect to see some lag time between heavy rains and lake stage fluctuations. This increase has placed the monthly surface level well above the historic average of 130.52 and still roughly 1.2 feet below the historic maximum of 132.4 reached in 2016. The current stage is positioned fairly high this early in the wet season. Close monitoring of SLs will be required as we progress into peak hurricane season. For additional information or questions please contact Devon Moore with the Natural Resources Division.